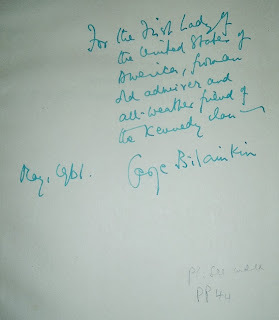 In May of 1961, British journalist and author, George Bilainkin, sent an inscribed copy of his 1947 book, Second Diary of a Diplomatic Correspondent to the new First Lady of the United States, Jacqueline Kennedy. 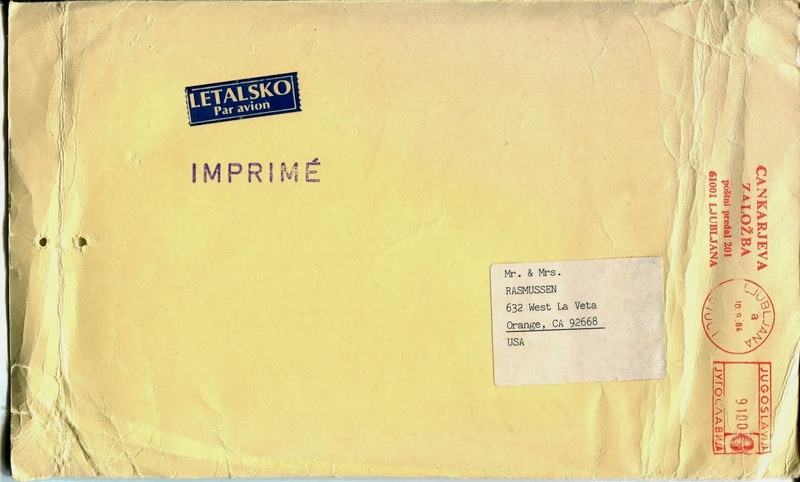 He also included a typed, signed letter on his letterhead and indicated a few pages of interest to the First Lady and perhaps the new President, whom he had known and met with on several occasions in 1945 at the close of World War II. 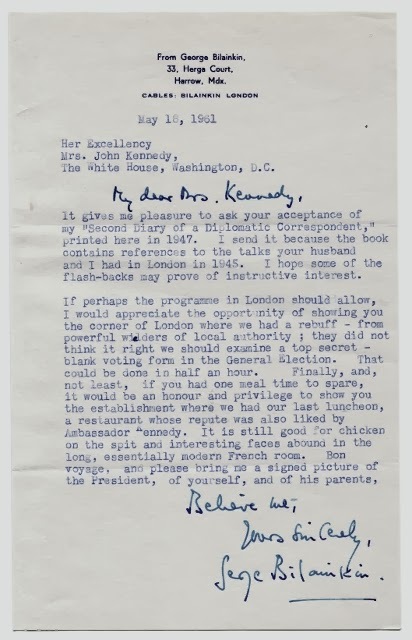 The book and letter were sent to Mrs. Kennedy in advance of an upcoming trip to London, in which the author hoped to meet with both, or at least the First Lady, and revisit a few sites pertinent to his meetings, as a journalist, with a young Jack Kennedy in 1945. He also knew the President’s father, Joseph P. Kennedy, Sr., when he was the United States Ambassador to the United Kingdom. 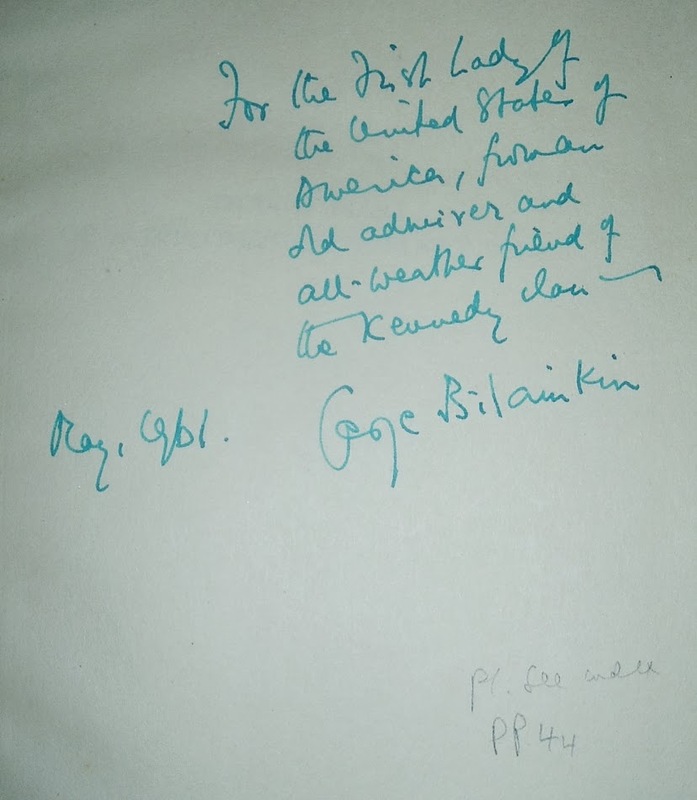 Bilainkin also expresses his wish to take Mrs. Kennedy to lunch and, as if that weren't enough, further requests she bring photos of herself, her husband, and his parents! 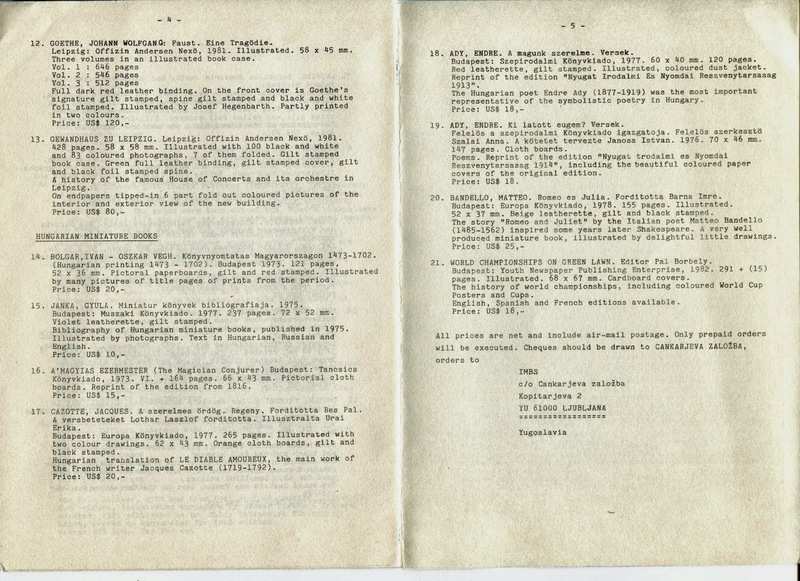 The Kennedys, on their first trip overseas, while in the White House, went to Paris, Vienna, and London. 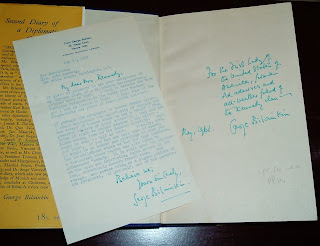 They were in London June 4-5, 1961 and it seems all but impossible that they had the time or desire to meet with a journalist whom the President had crossed paths with in 1945. 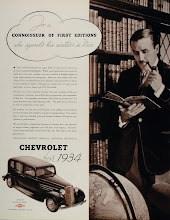 Certainly, it was never a consideration. 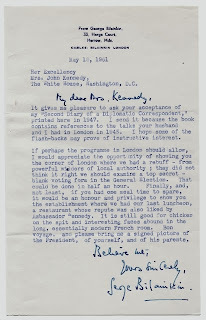 For the First Lady of the United States of America, from an old admirer and all-weather friend of the Kennedy clan. 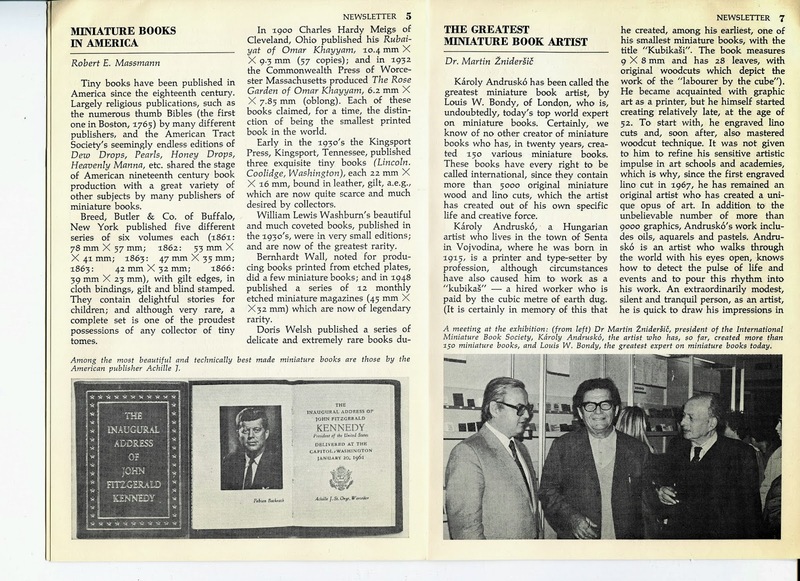 It is unknown, though, if Jacqueline Kennedy actually received this book, looked through it, and showed the author’s marked passages to the President (pages noted under the inscription above and in the Index). 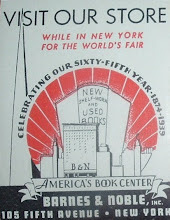 But it is intriguing to ponder that this book could have been in the possession of one or both for a time. 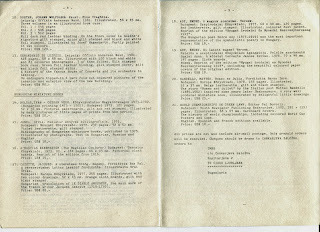 They left no writing of ownership or annotation behind to confirm that. 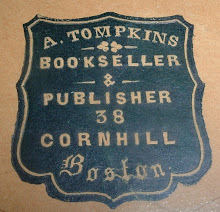 The book eventually found its way into a Washington, D.C. estate and later into the second-hand market, letter intact. 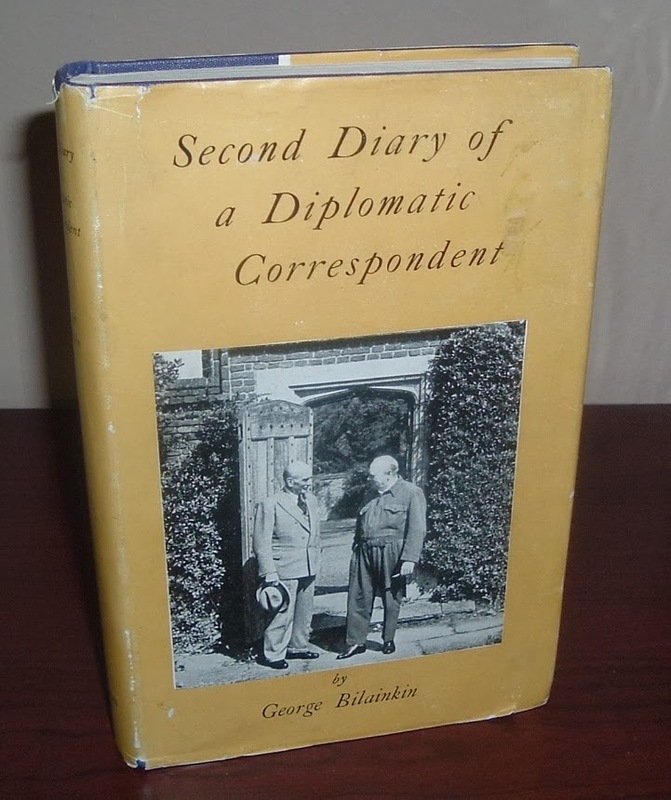 On its own merit, this book is an interesting history from a diplomatic correspondent’s point-of-view at the end of World War II. 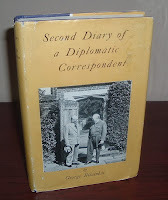 His intimate portraits of heads of state he met, such as Tito, de Gaulle, Churchill, and diplomats such as the aforementioned Kennedy, fill the pages of this follow-up to his 1940 published diary. 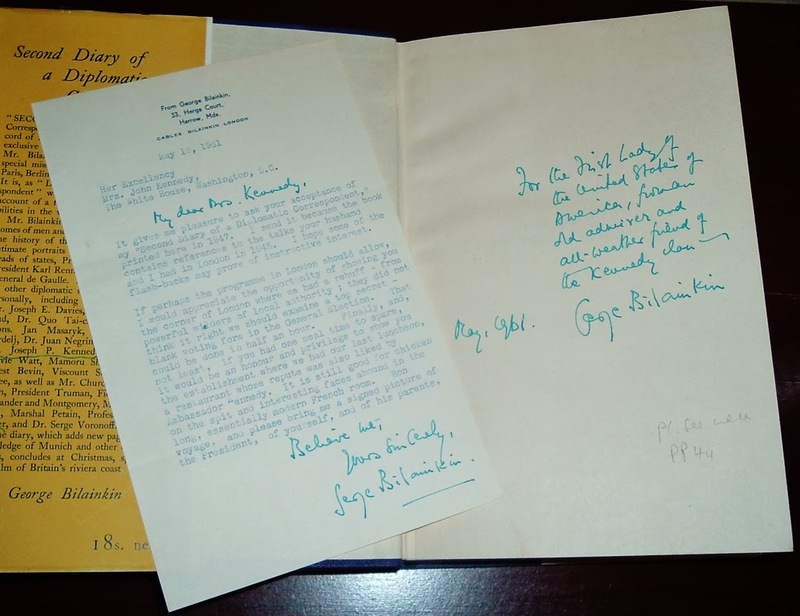 But it's the inscription and letter to First Lady, Jacqueline Kennedy, and the speculation that she or President Kennedy kept this on the White House bookshelves for awhile, that makes this particular copy even more interesting. 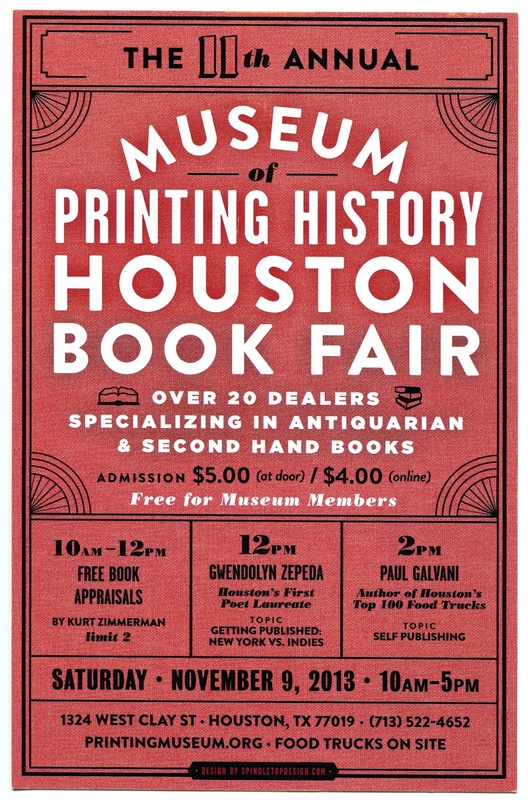 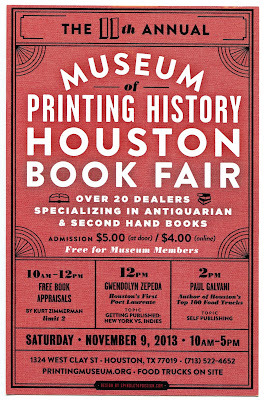 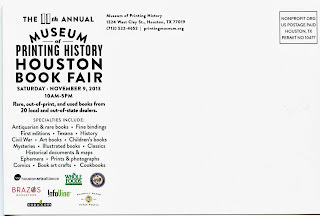 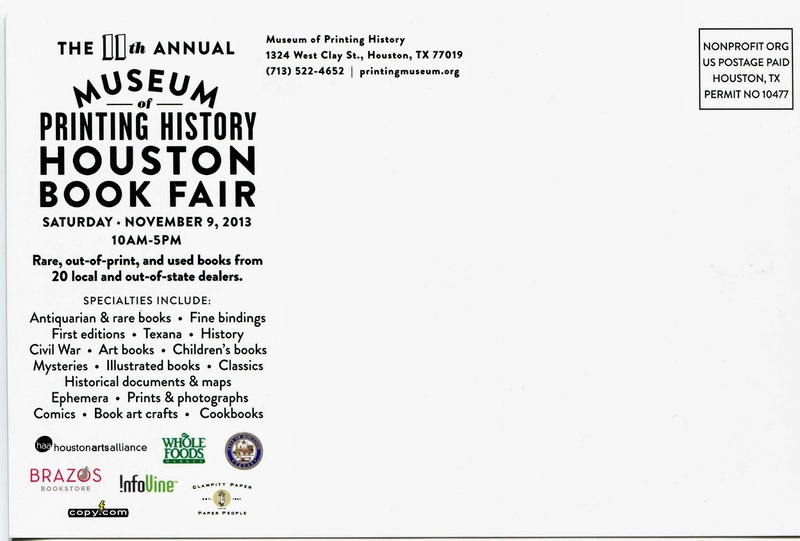 Here's the most recent addition to my collection of bookish ephemera, an ad mailer for the 11th Annual Houston Book Fair at the Museum of Printing History, Saturday, November 9, 2013. 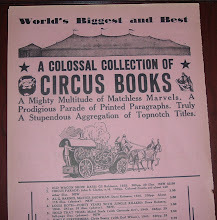 Regarding a recent acquisition of ephemera collected and preserved by the Rasmussens of California, here is another sampling of what that sight-unseen purchase contained. 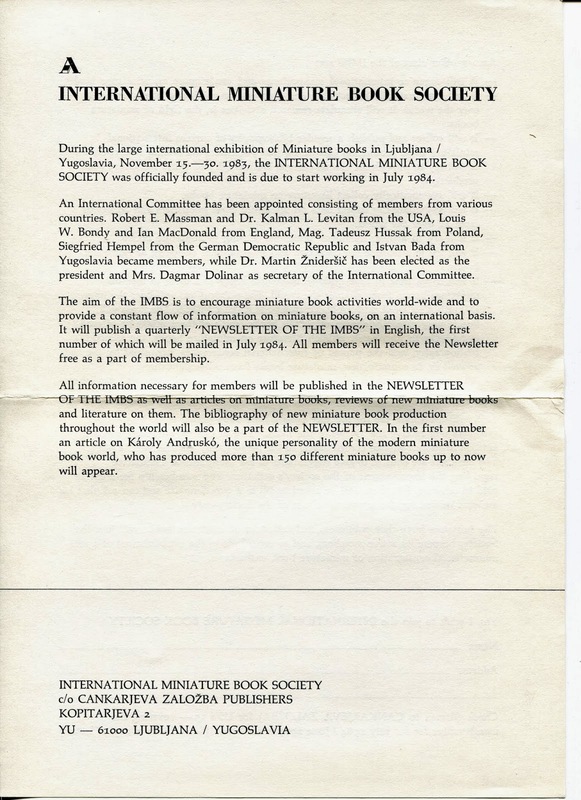 Dear Lovers of miniature books, In front of you is the newsletter of the new international organisation which wants to bring together the interests of lovers of miniature books from all over the world. 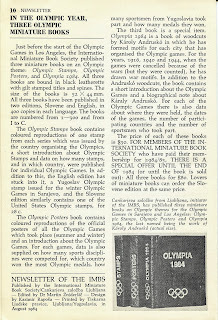 The stated goal is for a quarterly issue for the months of August, November, February, and May. 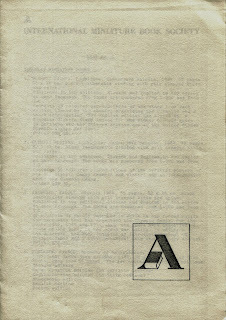 The editor states that this first issue is an experimental one and that the final shape of the newsletter, with member collaboration, will gradually become clear. 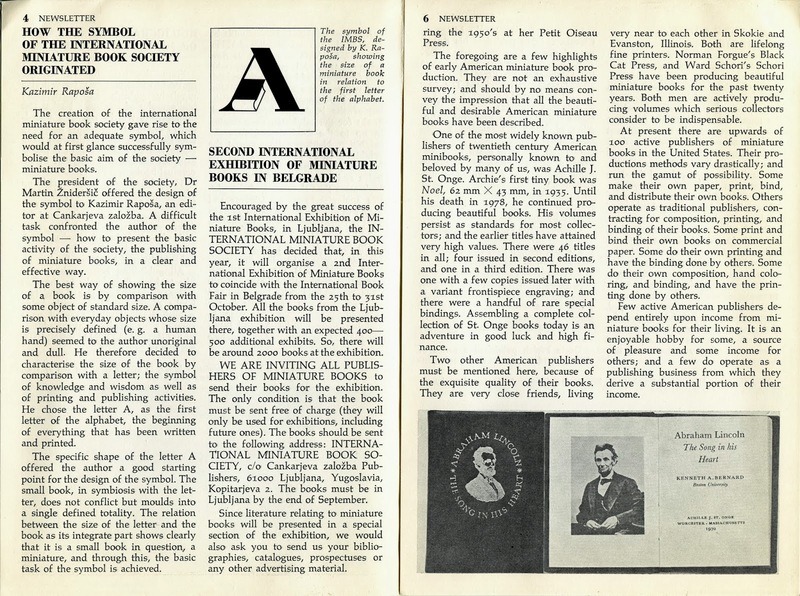 For anyone interested in miniature books, I have scanned the contents of this newsletter and presented the pages below (page 1 is above). 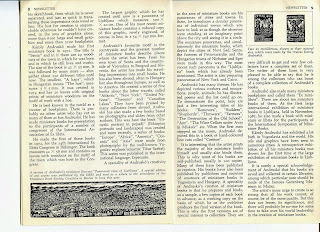 Click on a page for an enlarged view. 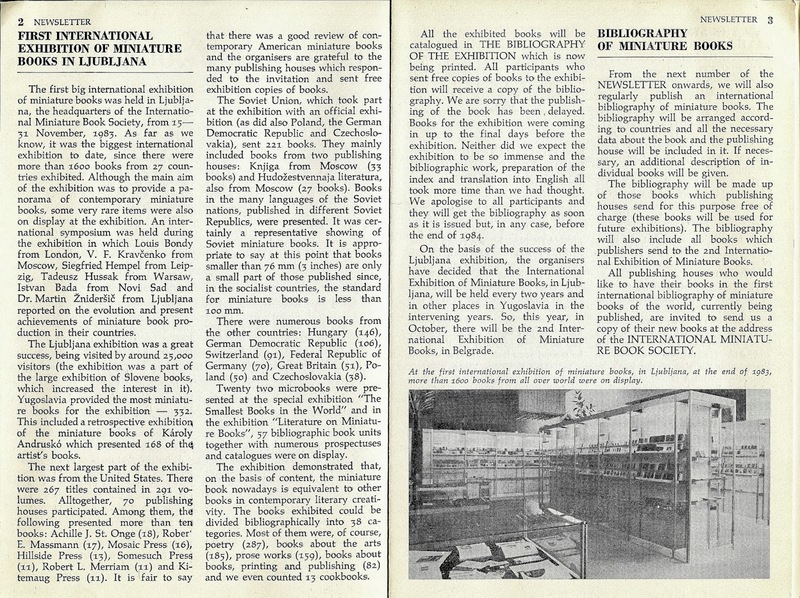 Articles include the following: First International Exhibition of Miniature Books in Ljubljana, Bibliography of Miniature Books, How the Symbol of the International Miniature Book Society Originated, Miniature Books in America, The Greatest Miniature Book Artist (Károly Andruskó), and In the Olympic Year, Three Olympic Miniature Books. 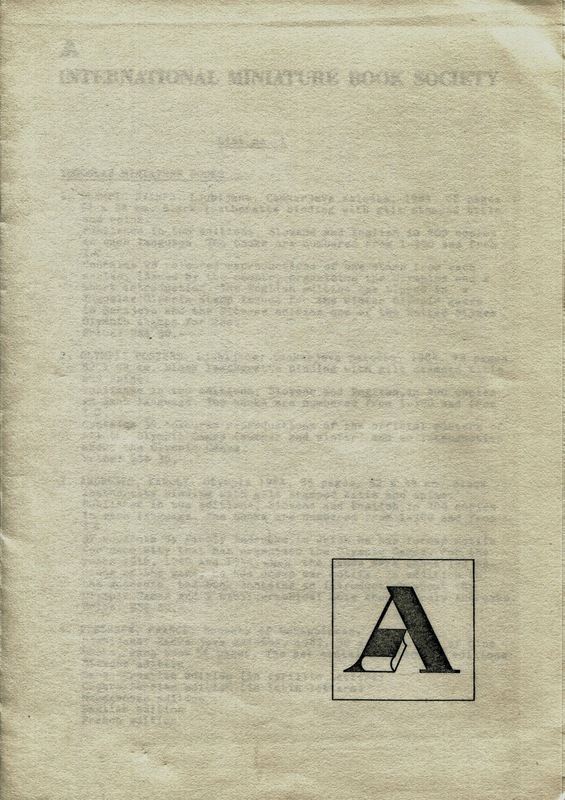 With the first number of our newsletter we are enclosing some information about the kind of plans we have for the society's future work. 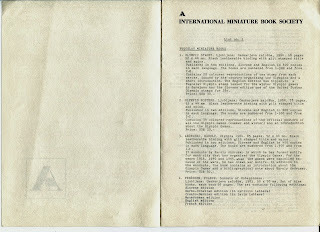 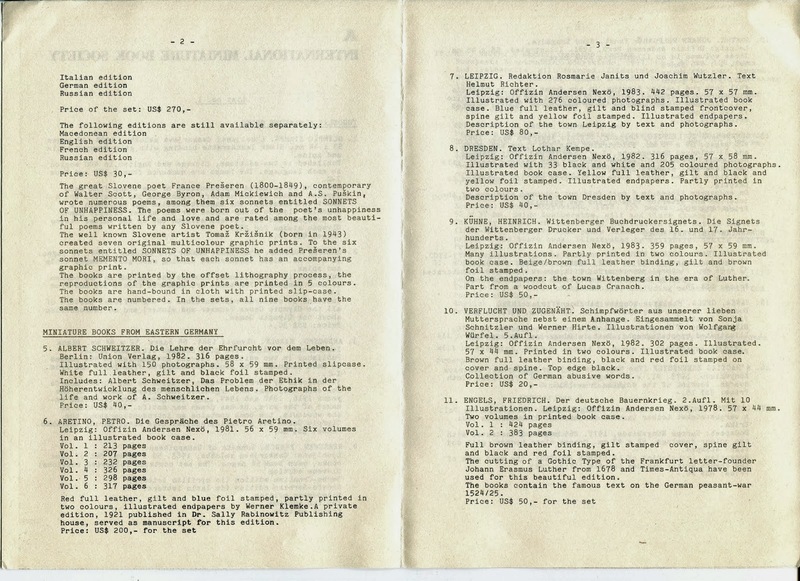 The first of those enclosures (below) is a single paper, folded, and printed on both sides with information about the IMBS, its founding, its aims, and a brief membership application section. 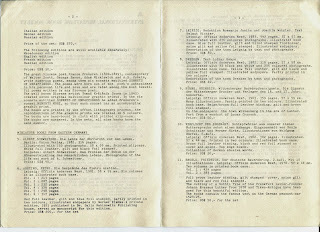 The other enclosure is a five-page list (List No. 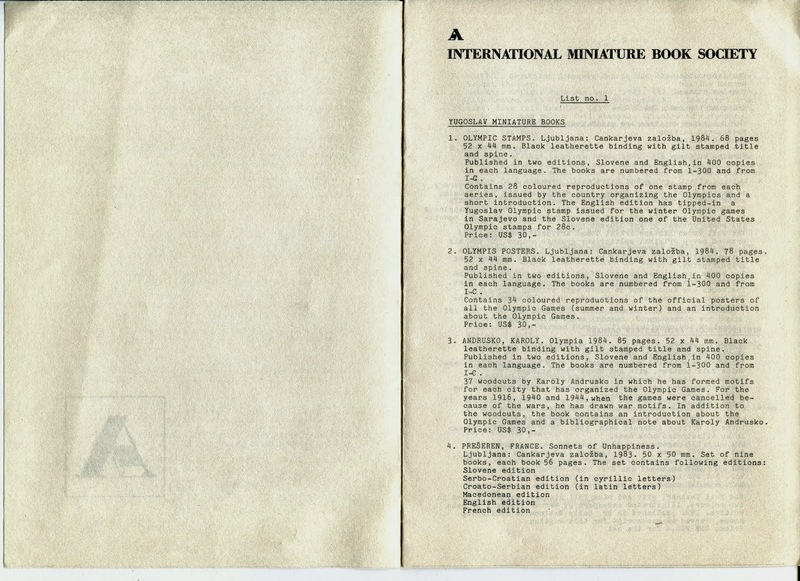 1), folded catalog-style, of miniature books available for sale through the International Miniature Book Society (see below). 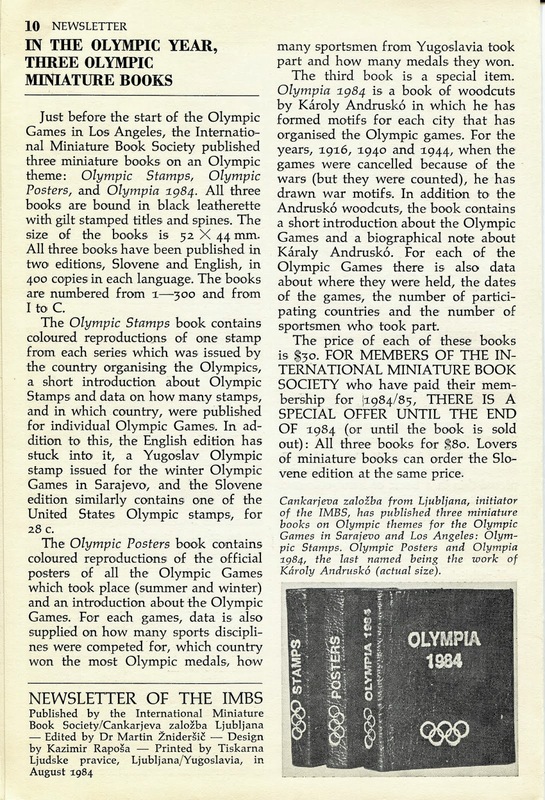 The books are listed by country--Yugoslavia, Eastern Germany, and Hungary. 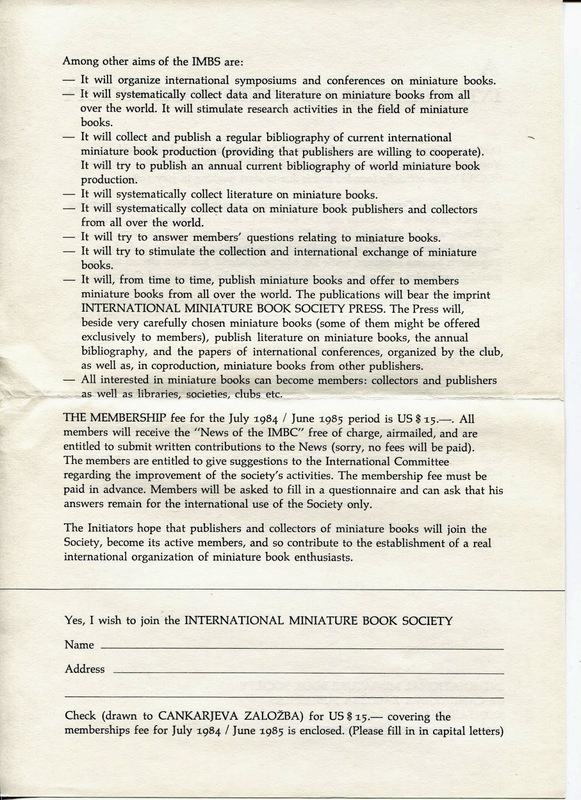 And there you have it--the complete inaugural package from the fledgling IMBS to members and prospective members. 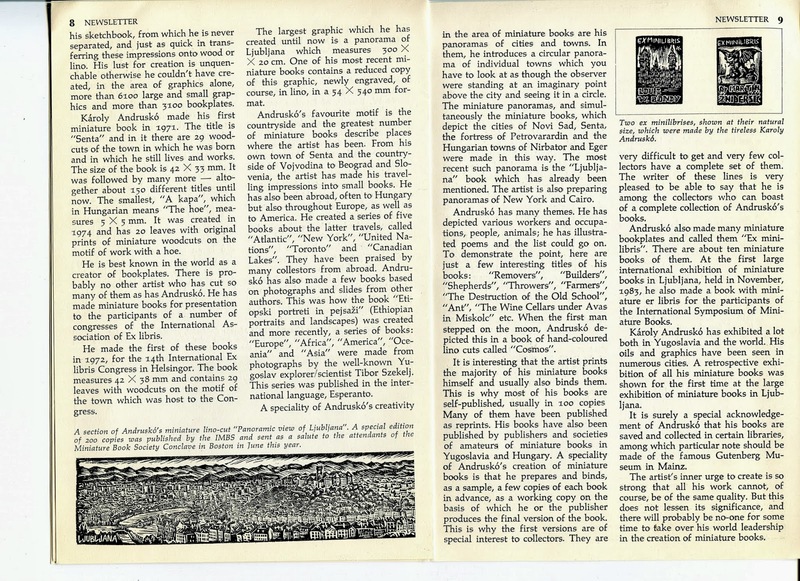 The society does not appear to exist today in its original form. 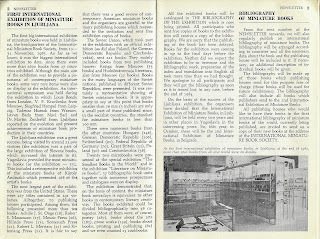 The complete lack of information available on the current status of the society supports that assumption. 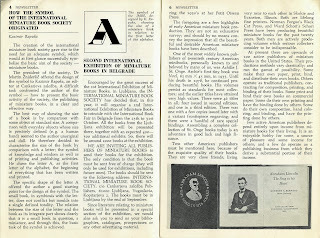 The latest reference I can find is from 2004--The Distinguished Book Award from the International Miniature Book Society. 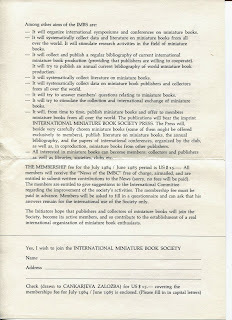 The Miniature Book Society, on its About MBS page, offers, perhaps, a clue to the demise of the IMBS. 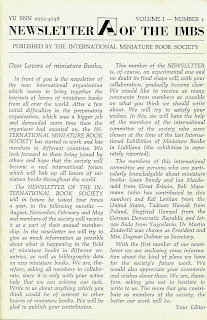 It indicates that it (the MBS) began in 1983 in the United States and now enjoys a worldwide membership. 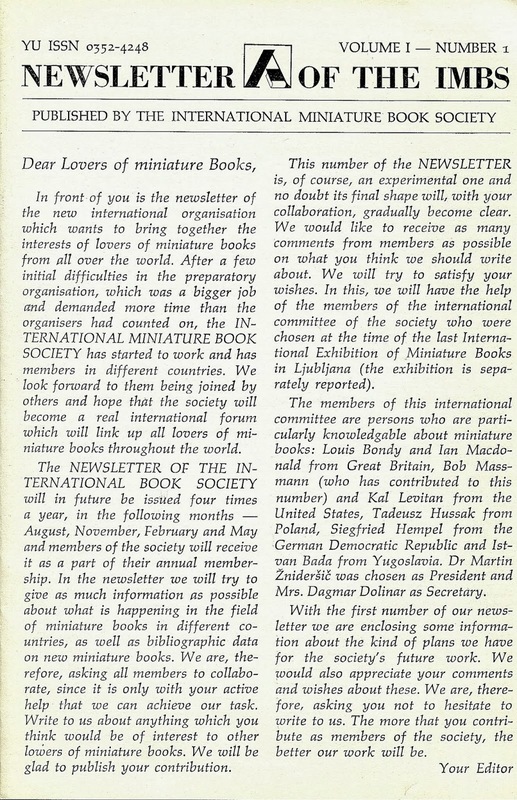 So, possibly, the IMBS was eventually folded into the MBS, as the need or interest in a segregated international society eventually gave way to an all-encompassing organization. 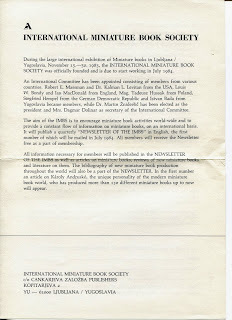 If my assumption of the IMBS' demise is inaccurate I'm sure I will be corrected sooner or later.